Thank you so much to everyone who entered my Vegan Lunch Box Contest. The deadline for entry was yesterday. I've been enjoying looking at all the yummy lunch pics and reading your wonderful, creative descriptions. Good job, everyone! Wow, it's going to be tough: there are over 50 fabulous entries and I'm going to have to narrow it down to 5. It makes me wish I had more books to give away! The five lucky winners will be notified via email on September 1st (my birthday! ), and their lunches will be featured here on the blog throughout the month of September. So stay tuned! "Shmoo"...hey, I like the sound of that one! P.S. In case you're not sure, no, shmoo is not my son's real name. It was just a family "term of endearment" I decided to use as a web alias when I started blogging. Little did we know! Little did I know when I planted 12 tomato vines this spring that they would eventually take over my kitchen and my life. Ah, here's ten quarts of canned tomatoes and three quarts of Roasted Tomato Basil Soup ready for the freezer. But look what's sitting next to them: more tomatoes! I've won the battle, but not yet the war. 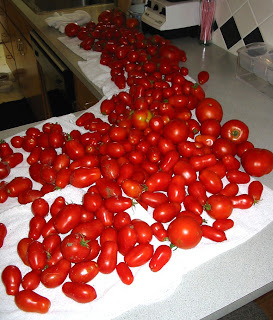 My next weapon of mass tomato destruction: Sneaky Momma's Tomato Sauce. So that's what my weekend looked like. How was yours? Sorry I'm a bit late with this one, but my medium apple cozy was at the county fair this week (blue ribbon, baby!) and I wanted to wait until it came home so I could include it in the picture. Here is the Apple Cozy Pattern (with pear variation) to go with the Banana Cozy and Orange Cozy patterns I already posted. Knit up a whole fruit bowl! You'll notice I wrote up this pattern in three sizes: small for those wee two-bite apples that are just right for the preschool set, medium for your average apple eater, and large for the biggest of apples or Asian Pears. Hey, knitters! 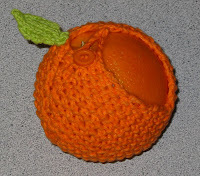 As promised in my recent fruit cozy post, I have been hard at work with needles and yarn and have devised an Orange Cozy Pattern for your knitting and lunch-packing pleasure. This will go nicely in your lunch bag next to the Banana Cozy you may already have knitted up. Get busy, because next week I hope to have a new apple/pear pattern for you, too. 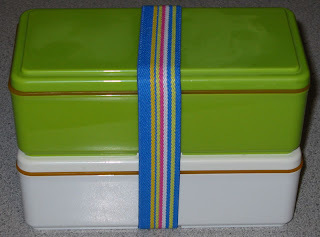 ...with these lunch boxes from Lunchsense. A reader pointed them out to me just last week -- I had never heard of them before. I love the different sizes to choose from (small, medium, and large), and the various containers. Not to put down Laptop Lunch Systems, but some of us with Laptops have mused amongst ourselves that it really would be nice to have lids sometimes. These lids look great: clear snap-top lids on all the food containers, and an easy screw-on lid for the 1 oz. dressing container and the liquid bottle. And look how it all opens out into a placemat! Pretty nifty. What do you think? What other great lunch boxes are there out there? Have you all been shopping for lunch bags/containers in preparation for back-to-school? Here's another recipe courtesy of The Manga Cookbook: Rice Burgers! The top and bottom "bun" are made from leftover Japanese sticky rice, pressed together and cooked until firm. "Like the bread on a sandwich, rice patties can hold just about anything in between. For vegetarians, rice burgers are a godsend, since fast-food chains in Japan often serve them with only sautéed veggies in between." We filled this burger with Tofurkey slices and topped it with two vegan cheese "sunshines". Next to the rice burger are Eco-Planet Non-Dairy Organic Cheese Crackers. That's right -- VEGAN CHEESE CRACKERS, people!! Woo hoo! Now I won't have to make my own all the time. In the top row are blueberries, carrots and Yumm sauce, and dried apple slices. Verdict: I couldn't wait for shmoo to get home today so I could find out how his lunch was, because I must admit I was picturing the rice bun falling apart as he tried to eat it. "Did it work?" I asked him. "Were you able to pick it up and eat it just like bread?" "YES!" he replied. "The rice held together good. Although I did eat the tofurkey first and then the buns." So there you have it, the perfect sandwich for all you gluten-freers! And the crackers are AWESOME; you would never guess you weren't eating a regular cheese cracker. 4 stars. Well, everyone, have a great weekend! 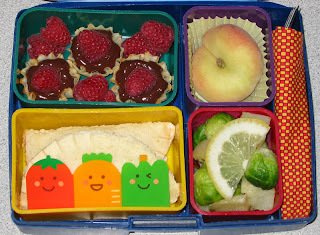 I hope you enjoyed this special summer camp week filled with new vegan lunches from the shmoo and me! Two lunches again today, one for my son and one for my husband. This time, surprisingly, they both chose the same thing. Japanese Curry is a dish my aunt introduced me to and I haven't been able to stop dreaming about it ever since. 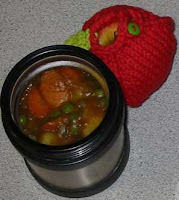 She cooks potatoes and carrots in water until tender (I added peas at the end) then throws in a bar of S&B Golden Curry. The warm, rich curry is served over white sticky rice, making it something of a Japanese Comfort Food. My aunt mentioned that she usually has to add a lot more water than the package calls for, and I agree. I started with about 2 cups of water and still had to add more. This curry gets very thick very fast! I wanted to make sure my husband had enough to eat, so I packed his rice and curry in separate containers in our 2-tier To-Go Ware. An orange in one of my fruit cozies is alongside. 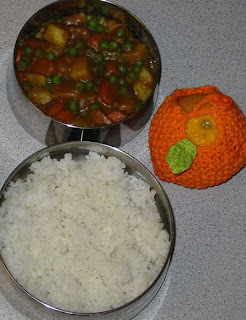 I packed shmoo's curry and rice together in a smaller Thermos, and he chose an apple instead of an orange. Verdict: From hubby: "Lunch was excellent. There was more than I could eat so I will save the leftovers for later. The curry was drier than I usually like it but the flavor was very good. The orange looked very cozy wrapped up in its little comforter. All it needed to be perfect was a piece of fresh-baked naan. Four stars." Hmm, Japanese naan? From shmoo: "That curry was good! Is there any more?" Four stars. It's our hero with the soy sauce fish head, Kikkoman! Wow, he even gets the girl! Two dishes today from The Manga Cookbook, a cute cookbook inspired by Japanese comic books and animation. If you like manga, anime, and bento boxes (and who doesn't? 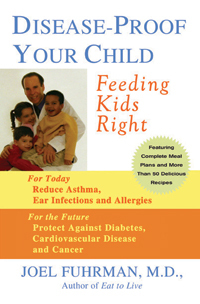 ), this is the cookbook for you! The book is filled with cute manga-style drawings illustrating each recipe step-by-step. Even better, there are little notes on the history of these traditional Japanese dishes, how and when they are eaten, and even references to the manga where these foods appear. The first recipe we have here is Naruto Roll: nori, tofurkey, and vegan cheese rolled together and cut into bite-sized pieces. Unfortunately, the vegan cheese I had (Tofutti slices) would not roll like the soft, creamy cheese pictured in the cookbook (looks like Velveeta to me). The vegan cheese crumbled and ripped, ruining the pretty roll effect. After throwing two rolls away and gritting my teeth in disgust, I finally figured out what to do: layer the nori, tofurkey, and cheese together on a cutting board with the cheese on top, then set the board under the broiler for just a few seconds, just long enough for the cheese to get soft. Roll away! Next to the Naruto are Jyagatama -- potato salad balls. I had never in my life imagined making mashed potatoes mixed with cooked peas, corn, and carrots, seasoning it like a potato salad (Vegenaise, lemon juice, etc.) then rolling it into little balls. Could this possibly be good? Next to the main dishes are steamed broccoli and green beans, with a happy apple food pick and a little soy sauce fish. And for dessert, a container of red watermelon and two Oreos. Verdict: Potato salad balls? Phenomenally brilliant. Seriously, they were sooo good, all creamy and tangy and you can just pick them up and pop them in your mouth. Who knew? The Naruto, on the other hand, was not such a hit. Shmoo ate one and then decided that as of today he no longer likes Tofutti. That was the only storebought vegan cheese he ever did like, so now we're down to none. Hey, it's okay by me -- I don't like it either! He has fun squirting the soy sauce fish on his vegetables. "Oh no, the fish is going to throw up! [then in a fishy voice] 'It must be some bad shrimp I ate. Blecccgh!' " 4 stars. Shmoo didn't want a thing to do with all the icky stuff I put in his dad's lunch today, so as you can see his lunch looks a lot different! For starters, instead of salads and spinach I made him two sandwiches filled with Chickpea Salad (recipe from Vegan Lunch Box). This is our answer to tuna or chicken salad, and pressing the sandwiches kept all the filling in and eliminated that nasty crust. I pressed the sandwiches closed using a dough press (aka dumpling maker). I discovered that only our smooshy white bread took to pressing; the whole wheat ripped at the fold. Shmoo did like the lemony potatoes I made for Dad, so I tucked in a few with his Brussels sprouts and topped them with a lemon to avoid any Brassica odors (this is a new concern for shmoo -- he doesn't want his lunch to "smell like anything", so I'm topping things with lemon slices and wrapping each container in plastic wrap). For dessert I packed shmoo a donut peach, and used the same frozen filo cups as in my husband's lunch, this time filled with chocolate pudding topped with raspberries. Verdict: It was all good but the dessert. The filo cups held up well with the drier spinach-mushroom mixture in my husband's lunch, but the pudding turned them to a soggy, unidentifiable mush. Note to self: stick with dry ingredients or use pie dough pastry next time. Not to worry, though: shmoo still got to eat a pudding when he got home. By the way, this was our first time trying storebought vegan pudding -- very, very yummy! 2 stars. Not one but two lunch boxes today -- one for shmoo and one for daddy shmoo. I figured I was up and cooking anyway, so why not? It's interesting to contrast a grown-up lunch like this one with the kid-friendly version coming up. They're very different! Our bumper crop of tomatoes and all the local cucumbers inspired me to think Greek Salad, and Greek Salad made me think Big Fat Greek Lunch Box! So there's the Greek Salad at bottom right, filled with fresh-picked tomatoes, cucumbers, kalamata olives, sweet onion, and a sprinkle of Greek oregano. Oil and vinegar dressing is in the little container. 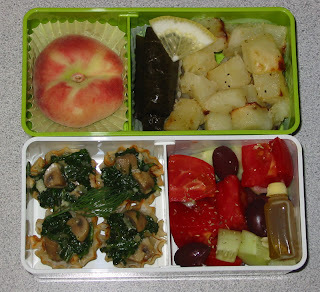 Next I wanted to make the Spinach Phyllo Triangles from Vegan Lunch Box, but my husband doesn't usually care for tofu. So I used the recipe anyway and substituted fresh button mushrooms for the tofu. Instead of using raw filo dough and baking them, I spooned the filling into premade frozen filo cups and put them right into the lunch box. So easy! At top right are tangy potatoes roasted in lemon juice and olive oil and two dolmas (rice-stuffed grape leaves). Finally, for dessert, a donut peach fresh from the farmer's market. I love these donut peaches -- they're so sweet, and the perfect size for packing in a lunch box. 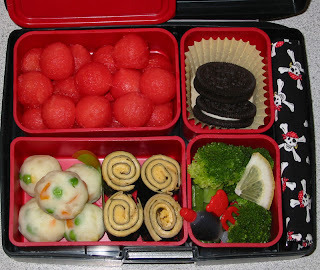 By the way, this lunch was packed in a new 2-tier Gel-Cool Bento Box from I Love Obento, our second attempt to find a bigger-sized lunch box to fit my husband. 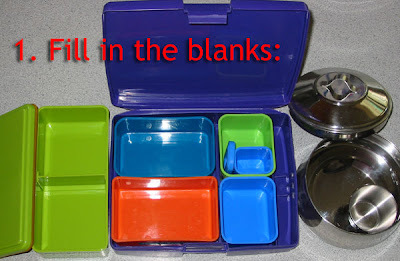 The lids are filled with freezer gel and act as little ice packs to keep the lunch cool. How neat is that? Hey, you lucky vegheads! Shmoo is at Adventure Day Camp all this week, and I'll be posting his lunches every day! 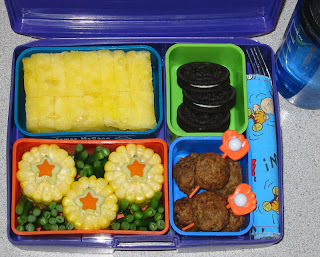 For his first day of camp I packed shmoo six Nate's Meatless Meatballs, with catcher's mitt-baseball picks for eating. Next to the meatballs are some "All Star Corn": fresh corn-on-the-cob, cooked and cut into rounds, topped with cucumber and carrot stars. I filled in the open spaces between the corn with blanched green beans. Above the corn is my son's new favorite: yellow watermelon from the farmer's market. I think he could eat an entire melon by himself if I didn't make him share. Because he loves it so much I used the container as a guide when I cut the melon into chunks, trying to get as much in there as possible. For dessert? Oreos, three this time instead of his regular two. Oh, and that's a bottle of water next to the lunch. Verdict: When I look back at his lunches in first grade most of them seem so small now, with tiny servings in half-full containers. Right now I'm packing his lunch box to the brim! To give you an idea of why, today at camp they went swimming and rock climbing, played tennis, and went to the park. I picked him up a bit early to take him to his first football practice. The boy is active. And he likes to eat -- today, he finished everything but a few of the green beans. 4 stars. THE VEGAN LUNCH BOX CONTEST! Pack a lunch, take a picture, and email it to me along with your name, mailing address, and a description of whatcha got in there. The top five lunch boxes will be featured here on the blog, and the five winners will receive a free autographed copy of Vegan Lunch Box! 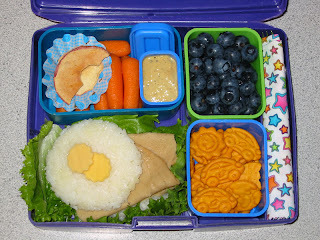 The lunches can be packed in any container, lunch box, or bag you like, but all the foods must be vegan (i.e. no meat, poultry, fish, dairy products, eggs, honey, or bugstuff). Points will be given for nutritional balance, creativity, and attractiveness. Entries must be received by August 25th. The winners will be notified via email on September 1st, and their lunches will be featured here on the blog throughout the month of September. Good luck! I can't wait to see all of your vegan lunch boxes!